Hydrating properly is essential to every aspect of your running. Most of us have experienced the downside of both over hydrating as well as not properly hydrating. From doing the porta potty dance before a race due to too much hydration (getting in line and using the porta potty and then filing back into line over and over again) to having a race end badly because you didn’t hydrate enough, getting the right amount of water can be a tricky equation. There are some simple rules to follow to help you get started but then you need to experiment to find what works best for you. Some runners need a lot of water to get through a run and others can get by on just a little. I personally can make it through most long runs on just a drink before I get started but I know that doesn’t work for the vast majority of runners and I don’t recommend it at all! However, I drink around 4-5 liters of water everyday throughout the day. Before going out for a morning run it is recommended that you get at least 8 ounces of water into your system. Longer runs may require at least 16 to 20 ounces of water approximately an hour or two hours before you start and another cup or two just before you set out the door. And yes coffee does count to some extent as your morning hydration, but I would still recommend a bit of plain old water too. You do not want to drink a gallon of water before you set out the door, even if it is really hot and you plan to run 20 miles. It will slosh around in your belly and make you pretty darn sick. On the other hand, you also don’t want to jump out of bed and run out the door without a sip of water because you are bound to be dehydrated. Many of us runners have experienced a pretty awful sensation where we push through a run on very little water and actually feel ok at the end. But once we get home and sit down severe nausea sets in and we feel dead to the world. This is a pretty nasty form of dehydration! If you are going to go out and run 3 miles or approximately 30 minutes or less, this hydration plan should be enough to get you through your run until you get home. 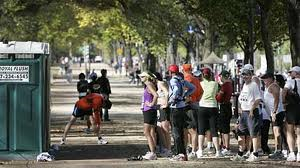 If you are doing a longer run you will need to have additional water or other drinks along the way. The best plan during a long run is to drink to thirst. This simply means if you feel thirsty, drink. Typically on a longer run you want to plan on drinking approximately 4-6 ounces of water every 20 minutes. If your run is longer than 90 minutes you might also want to add in a carbohydrate form of drink such as PowerAde or Gatorade. 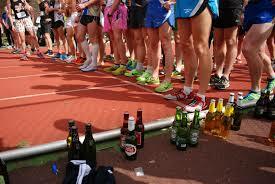 It is important to practice with different hydration forms before a race to see which one works for you. I tend to get even more thirsty when I try an energy drink on the run so I just avoid them. If this is the case for you, perhaps trying an electrolyte supplement in your water such as Nuun tablets can help. These are pretty tasty and will help replace some of those electrolytes lost with your sweat, especially important on a hot or humid day. Many runners also like Nuun because these tablets are very low in calories and offer a nice light flavor. After your run it is extremely important that you begin rehydrating right away. Aim for at least 24 ounces of water after your run. You can also weigh yourself before a run and then again upon your return. 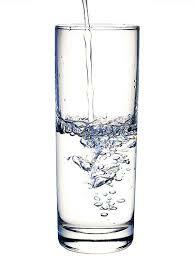 For every pound of weight lost aim for consuming one pint of water. This is also a great time to consume a sports drink to get in your lost electrolytes. It is most important to remember that your overall hydration doesn’t just begin the morning of your run. What you drink and how much you drink in the days before a run or a race are part of the combination that will help carry you through. Doing shots the night before is certainly not going to help you feel very good the morning after nor will it help out on the road. In the same way, drinking plenty of water in the days leading up to a race will help keep you fully hydrated and definitely help out if your have a long, hot or humid run coming up. That being said, I think it is great to find some sort of container to keep with you every day and drink up all day long. I have a Nalgene that I carry around everywhere with me. I love Nalgenes because they come in various sizes and colors and are dishwasher safe, BPA free and are very durable. They also don’t retain flavors so if you add some lemon or cucumber to your water it won’t taste like that forever. It really will make a huge difference. Perhaps post run but not recommended before! I really like the tips on hydrating during a race. However, I am really impressed by your ability to drink 4-5 litters of water per day. How do you do it? My problem is that I forget to drink. I know, it sounds super weird but that’s my case. I actually down one really fast first thing in the morning and then just keep chugging all day. With a little practice it becomes the norm. This also sounds odd but I am always cold. My acupuncturist recommended drinking my water at room temp. During the winter it makes drinking it much easier and I am so much warmer now. I’ve been struggling with hydrating enough after I run. It feels like I just can’t get enough water with is so frustrating! Tons easier to hydrate in non-arctic temperatures (go away winter…). Are you worried about flushing the appropriate electrolytes out of your system with so much water? Since I’ve really cut salt and processed foods, I find myself much less thirsty. Check out Honey Maxx in Canada. They make a powdered drink mix much like Gatorade, except it’s made from organic honey, and not all the processed sugar and stuff made in a laboratory. And since you can mix it yourself it lets you control how much you’re getting. Real good for the young’uns. I tend to drink little during a long run or race. Things like Gatorade make me sick, I keep drinking before going out and right before I start a little sip. Sometimes is nice to just rinse your mouth, specially on hot and dry days. Great idea with just a rinse. Thanks for the ideas! Recovering from a case of dehydration right now, after my 9-miler today. Lesson learned about hydrating properly. My favorite post-run recovery drink is low-fat chocolate milk, however. Thanks for the reminder and the tips. Thank so much for your kind words and welcome!